Back in the earlier days of MIDI, all keyboards had standard 5 pin MIDI ports and a couple of pedal inputs for sustain, volume, etc. If you needed more control, you simply added a MIDI Merge box to get all of your control into the synth, sampler, or computer of your choice. Many modern keyboards simply have a USB port for direct connection to a computer, and only have an input for a sustain pedal. While this is fine for little Susie practicing piano at home, it does not work for a modern keyboard part in a musical. The keyboard player is often asked to play string patches, and other kinds of sounds that need live, dynamic control. They are also often using a program like MainStage or RMS Keyboards and require the ability to change patches with a foot pedal. MainStage is a very powerful program, and doesn’t need any help with its MIDI implementation. But RMS is hard-coded at the factory to only be able to see one MIDI source at a time. So what to do?? MAX to the rescue! 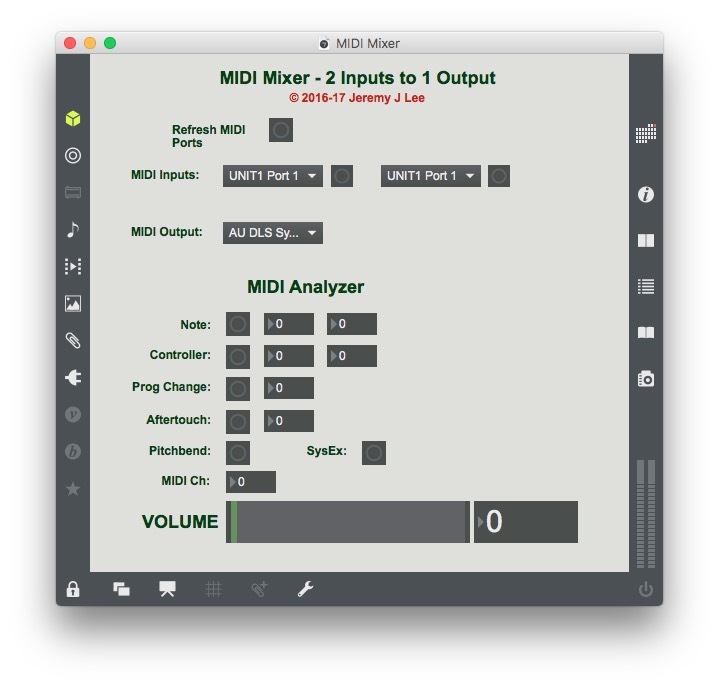 I wrote a little patch that can take two MIDI devices (a keyboard and a foot pedal system – the Logidy UI3 is my current favorite), combine the MIDI streams, and send them to the software on a virtual MIDI port. As an extra bonus, I added a MIDI monitor function so you can confirm your MIDI messages. I also added a slider with a large numerical display so that the player can easily set their volume pedal to a predefined location as needed.